Michael Jung (GER) has won most of the glittering prizes on offer in the sport of Eventing, but the reigning Olympic and European Champion has yet to take on the special challenges of the Land Rover Burghley Horse Trials (GBR), sixth and final leg of the FEI Classics™ 2014/2015. 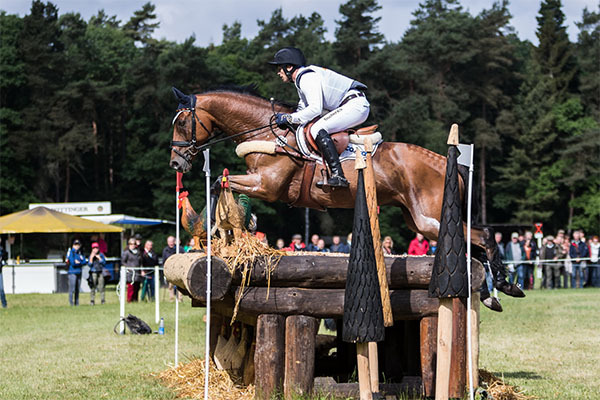 Spectators will be treated to the sight of this master horseman tackling the big, bold Cross Country track in the beautiful grounds of Elizabethan Burghley House on his two top horses. Jung is bringing the mare fisherRocana FST, a world team gold and individual silver medallist last year, and old favourite La Biosthetique Sam, his Olympic, world and European champion. The two horses finished first and second at Kentucky (USA) in April, the third leg in the FEI Classics™ series. Ingrid Klimke (GER), who has established a clear lead in the FEI Classics™, is not entered for Burghley as she is focusing on next week’s Longines FEI European Eventing Championships in Blair Castle (GBR), but Jung, who is currently second in the rankings, William Fox-Pitt (GBR) and Jonelle Price (NZL), third and fourth respectively, will be jostling for the five money prizes. The three are currently ranked first, second and third in the world. Fox-Pitt (GBR), a record six-time winner at Burghley, is expected to save his top horse, Bay My Hero, for the British team at Blair Castle the following weekend, but he has an able mount in the form of the relatively inexperienced Fernhill Pimms. Price, also, has only one ride, the experienced Irish Sport Horse The Deputy. Sir Mark Todd (NZL), currently just outside the money prizes in sixth place in the FEI Classics™, has already won Burghley five times. The great Kiwi horseman has been enjoying a stellar season and must have an excellent chance here on Leonidas ll, fourth at Badminton in May. An impressive New Zealand entry is completed by Jock Paget on Shady Grey, 10th in the FEI Classics™, and Tim Price, seventh, on Ringwood Sky Boy, but, for the first time for more than 25 years, the nation’s line up will not include Andrew Nicholson. The five-time winner and defending champion, who has won the last three runnings of Burghley on Avebury, is currently recovering from the neck injury sustained in a heavy fall at Gatcombe last month. For an even longer Burghley record, one has to return to 1979, when a young Australian, Andrew Hoy, won on the little stock horse, Davey. It took him 25 years to win again, in 2004 on Moonfleet, and for the 2015 edition he pins his hopes on Rutherglen. The field also includes two more former British winners, Pippa Funnell and Oliver Townend, who could have three rides apiece. Interestingly, for both riders, their best chances may lie with spectacular, long-striding chestnut geldings, Redesigned (Funnell) and Armada (Townend), but neither horse is the easiest in the Jumping phase. Around 80 horses from eight nations are expected to start at what promises to be as thrilling a Burghley as ever. The full startlist and live results are on www.burghley-horse.co.uk .